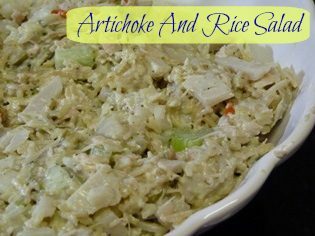 You are here: Home / Recipes / Dinner / Artichoke And Rice Salad! Susan is back with another recipe – this one is an Artichoke and Rice Salad! Saute the Rice-a-Roni in the butter. Add the water and cook the Rice-a-Roni until done. Drain the artichokes and reserve the liquid. Chop the artichokes, olives, onion and celery. Combine all the ingredients, including the liquid from the artichokes. Refrigerate until cold, preferably overnight. However, we ate some right away and it was pretty tasty. Thanks! I fixed it – it looks yummy!